We welcomed Pierce Campbell and Thomasina Levy to a “Live In Studio A” edition of Profiles in Folk. 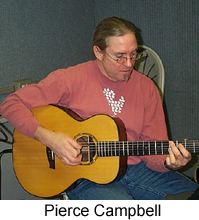 Pierce, who has been with us several times through the years, is the reigning Connecticut State Troubadour and Thomasina is his immediate predecessor. State Troubadour is a position established in 1991 by the Connecticut General Assembly that functions as a state ambassador of music and song to encourage cultural literacy and promote the state of Connecticut. 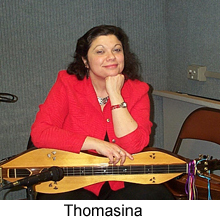 Thomasina, making her WSHU debut, represented the state in 2005 and 2006 and Pierce is in the final year of his two-year appointment. It was a wonderfully engaging two hours covering a broad array of discussion topics that included, of course, what it’s like to be State Troubadour to differing musical styles to how their careers evolved. And there was plenty of fine live music, as well, engineered by WSHU Chief Engineer Paul Litwinovich.